For today’s contemporary audiences, the name Samuel L. Jackson is likely to trigger the name Nick Fury in their minds, but Jackson has had a long, successful career filled with plenty of mainstream hits under his belt. However, some of his lesser films have fallen under the radar and become somewhat forgotten for one reason or another. In My Country from 2004 is one of those films. 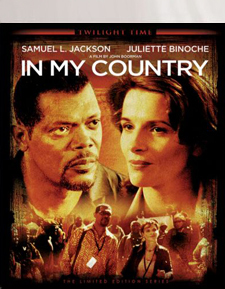 Based on Antjie Krog’s memoir Country of My Skull, In My Country is a John Boorman film about Afrikaner poet Anna Malan (Juliette Binoche) and American journalist Langston Whitfield (Samuel L. Jackson), who are both sent to South Africa to report on the Truth and Reconciliation Commission hearings. Whitfield is to interview Colonel De Jager (Brendan Gleeson), who has been accused of human rights violations, including torture and murder. Despite the fact that Whitfield and Malan are on the opposite sides of the fence, they find that they are able to work together, which eventually, leads to something more. Filmed partly in and around Cape Town, South Africa, In My Country is a decent film. Juliette Binoche and Samuel L. Jackson both give superb performances, while the film’s message is loud and clear. However, the love affair between the two characters is the main drawback, slowing down the momentum of the more important storyline about cruelty toward African Americans. Brendan Gleeson is also excellent as De Jager, the man responsible for crimes committed against the black people of the country who were labeled as terrorists by the controlling whites. In My Country makes its Blu-ray debut courtesy of Twilight Time. Image quality, through an HD master provided by Sony, is stupendous. The scenery of South Africa in broad daylight is vivid with deep textures. Detail is exceptionally sharp during the evening scenes as well with black levels appearing well-balanced. Colors are robust and vibrant, particularly greens and blues. Skin tones look accurate with a large amount of fine detail in close-ups. The film has never looked better. The two audio options for this release are English 5.1 and 2.0 DTS-HD, with the stereo track being much louder and stronger than the surround track. Special features include an isolated music track; an audio commentary with director John Boorman; deleted scenes with optional director commentary; interviews with actress Juliette Binoche, director John Boorman, screenwriter Ann Peacock, and producers Robert Chartoff, Lynn Hendee, and Mike Medavoy; the original theatrical trailer; a scroll-through of the current Twilight Time catalogue, and an 8-page insert booklet with an essay on the film by Julie Kirgo. I would definitely recommend In My Country to Samuel L. Jackson die-hards and those who have an interest in South African history and culture. This Blu-ray release is a phenomenal viewing experience. It’s also a worthy upgrade and highly recommended!